It’s hard to feel lonely when you have a Facebook community to lean on. Being five hours ahead of the time at home can make me feel a little isolated on Sunday mornings, when the people I love most are still asleep. 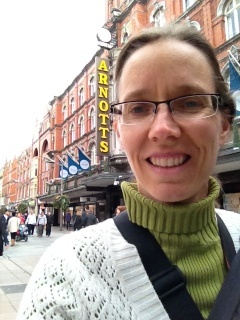 But what do you know, another Fulbright living in Ireland jumped right in this morning via FB and offered solidarity. Scene from Wilde’s story about the characters of Dublin, set in 1848. 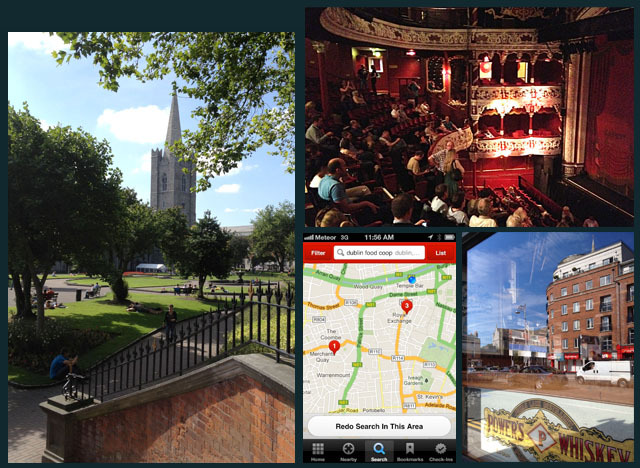 I perked up after heading across town to the Gaiety Theater for a Sunday matinee. Oscar Wilde’s stories were delightful due to some great choreography and skillful acting. Perhaps he didn’t mean it to be so comical, but nevertheless, it was a highly entertaining theatrical production. It was delivered entirely in third person to keep true to Wilde’s text (which wasn’t penned for the stage). The stories involve a bunch of off-beat personalities, but most of them are lovable enough. I’m sure the book itself could get depressing, but the play seldom did. 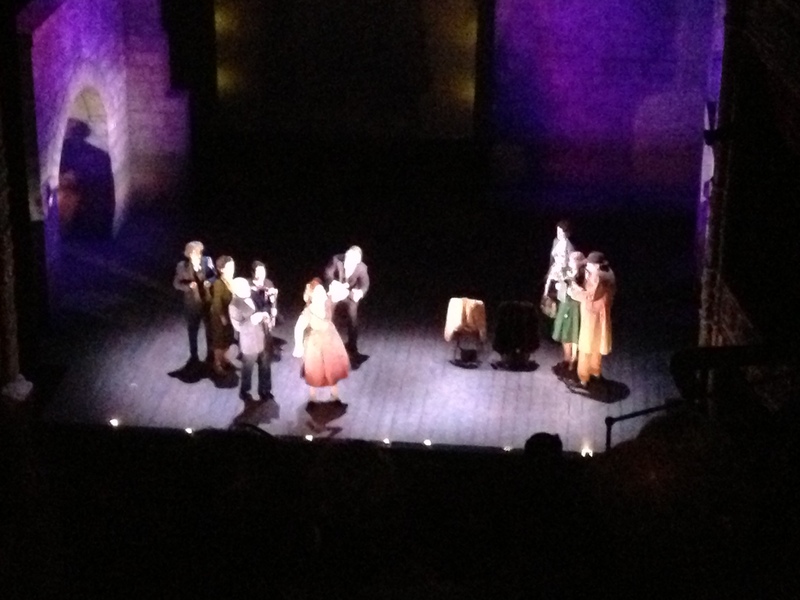 There was even a singer in the play who reminded me of my Dad’s cousin, Robin Massie. With her beautiful curly red hair, super-cheery personality, and incredible soprano voice, Robin could definitely find a place on stage here. Sunday afternoon streets are always full of people — as long as the rain holds off. The design of the Gaiety Theater is itself a treat. Inside, it looks a lot like the Olympia (which I posted a picture of previously), except that this theater is bigger. It’s where Riverdance performs, for instance. 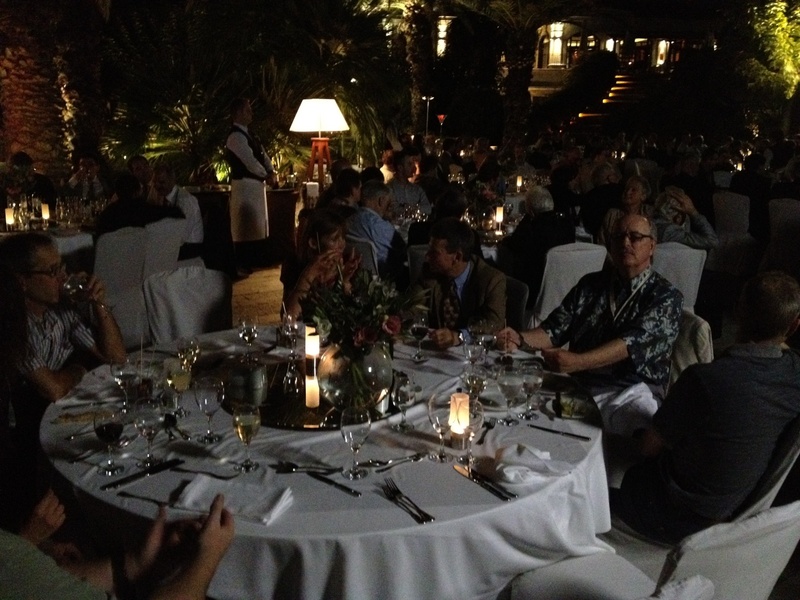 I also finally sought out the Cornucopia restaurant. It specializes in vegetarian, wheat-free, gluten-free, vegan, and sugar-free options. And, believe it or not, they also specialize in delicious dishes! I wonder: How on earth did it take me so long to find this place? Mark (at the Kildare Street Hotel) told me about it weeks ago. Shopping for light bulbs, a bell pepper, and ginger root on the way home… along with everyone else! 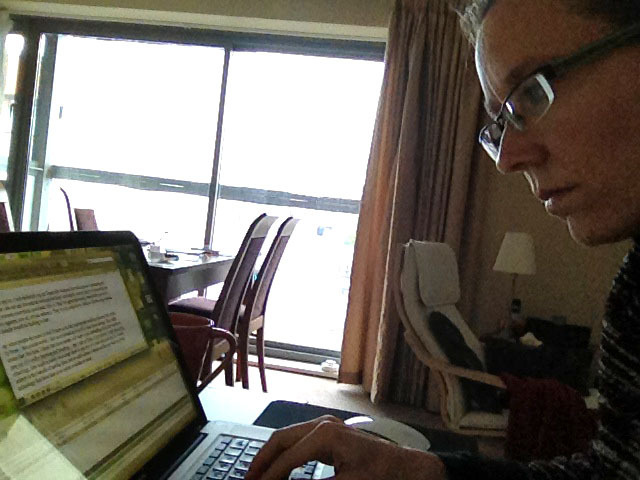 Shopping successful, tummy full, and Shannon happy, I returned home to reflect and transcribe. PS — My new URL is shannonchance.net to save you a few keystrokes. If you receive my blog posts by email, I recommend you click the title of the piece when they arrive, so you can read the online version. That way you get a better graphic experience (and sometimes a few less type-os). Now, if only I could figure out how to control this crazy template’s layout. An urban reflection from today. Thessaloniki was amazing! I had most of a day to explore the city before the conference started. I had no trouble getting around and the Greek people were amazingly helpful. 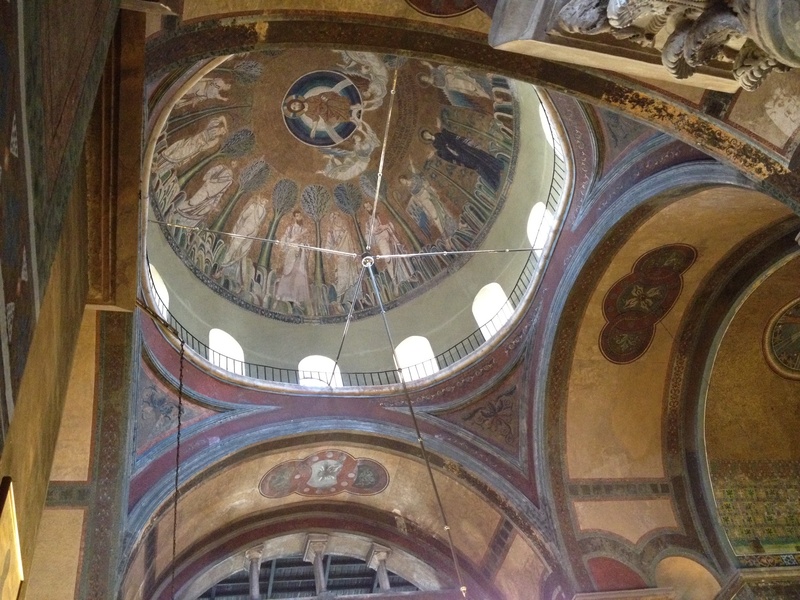 Inside the down of the Agia Sophia church. I was lucky to be exploring the city on a Sunday because all the churches were open for celebrating mass. 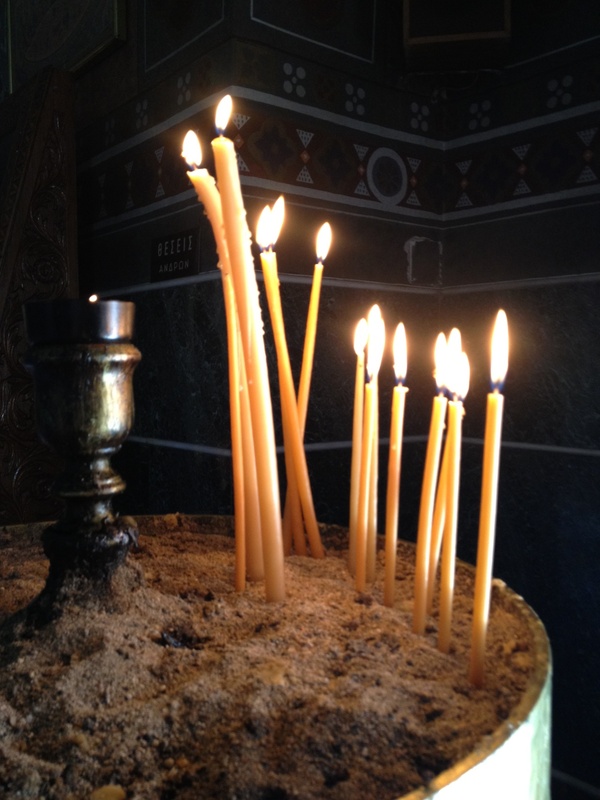 I observed christenings in two different churches–one that has a basilica (Christian cross) plan and another with a Byzantine cross plan (where all the arms have equal length). The basilica plan is typical of Roman planning (of Roman Catholic heritage) and the other (like San Marco in Venice) is typical of Greek Orthodox planning. This area was under control of the Ottoman Empire for a period of time, after it belonged to the Roman Empire, and the Ottomans worked to convert the Christians to Islam. 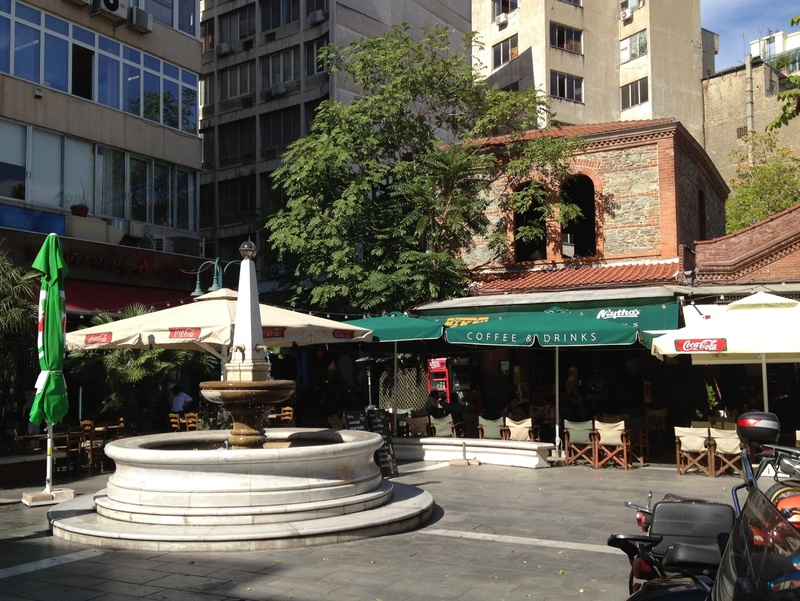 There are Roman and Byzantine scattered artifacts throughout Thessaloniki. I missed the actual baptism and anointing, but after that a team of women dressed the baby head to toe. 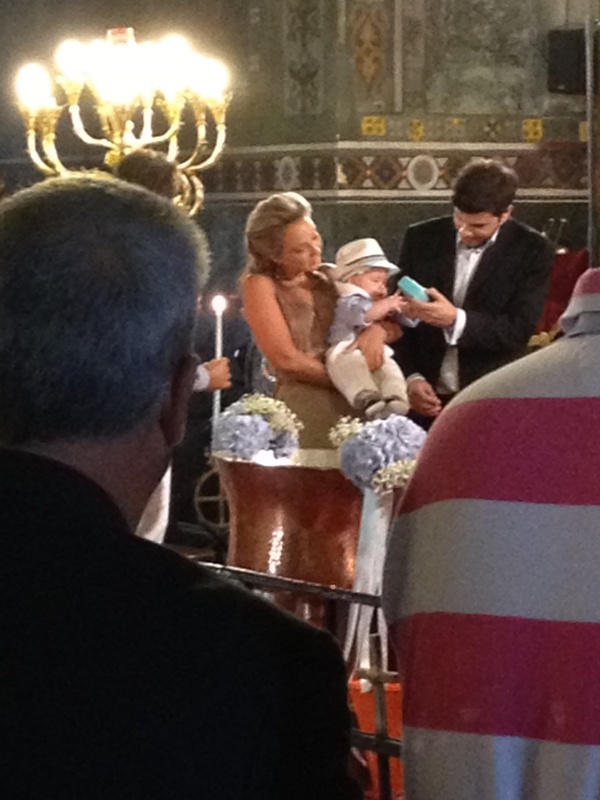 Here the parents presented the fully-dressed child. I particularly enjoyed visiting the Greek Agora (which became a Roman Amphitheater during Roman occupation of the area) and the Museum of Byzantine Culture. I had visited the Museum of Byzantine Culture for just an hour on my own, so I was thrilled when the conference included a dinner plus tour there as well. I felt like a kid in a candy store! 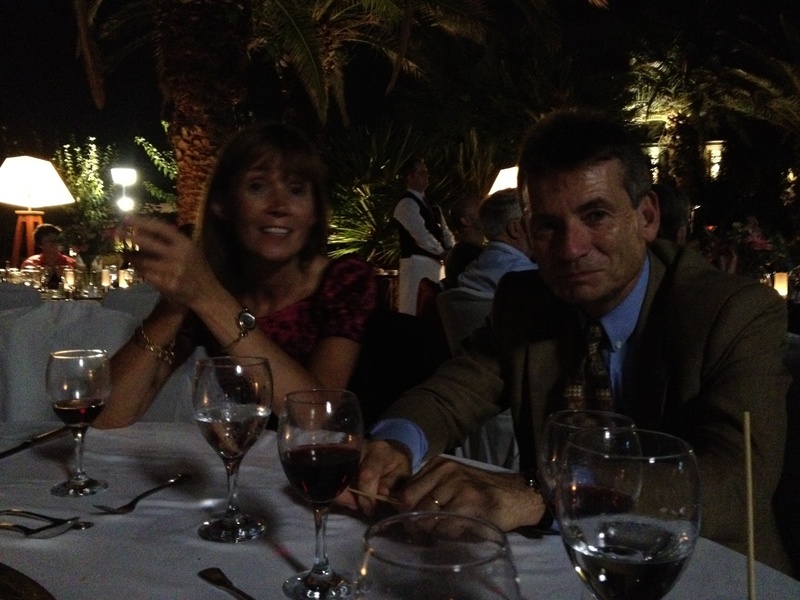 I’m not one to dwell on negatives, but I will mention a couple of oddities of my stay in Greece. There were two bus loads of riot police parked in front of my hotel the entire time I was there. One week prior to my arrival, the police had reclaimed the building a few doors down. It had been held by a group of anarchists for the past five years. I could see burn marks on the underside of the balconies of the building as I walked by. 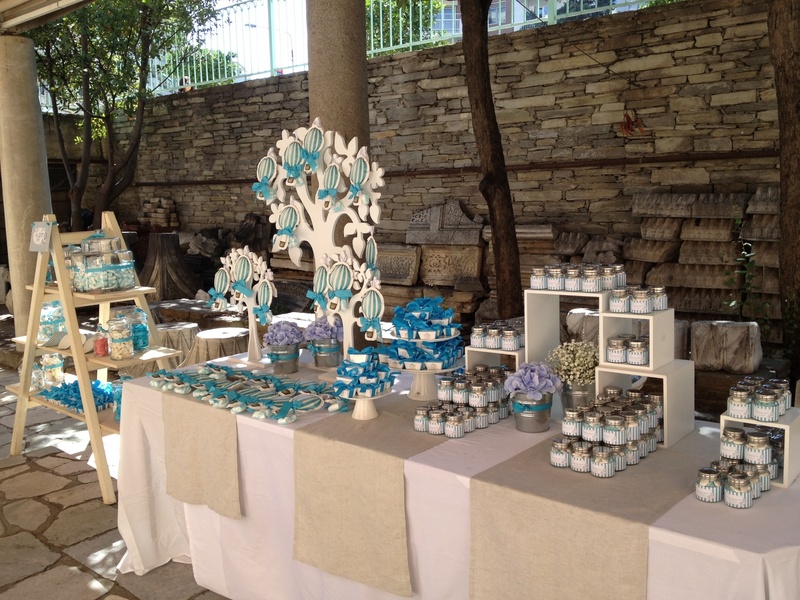 All set up outside for the after-baptisim festivities. In the past, I had heard that the riots I’d witnessed in Rome were organized by anarchists from the Balkins, and not by Italian people. I’ve been in or near Rome for two, both of which were in response to visits by President Bush the second. I can’t vouch for the accuracy of that claim, but it certainly seems possible to me now that I’ve seen the anarchists in action in Greece. 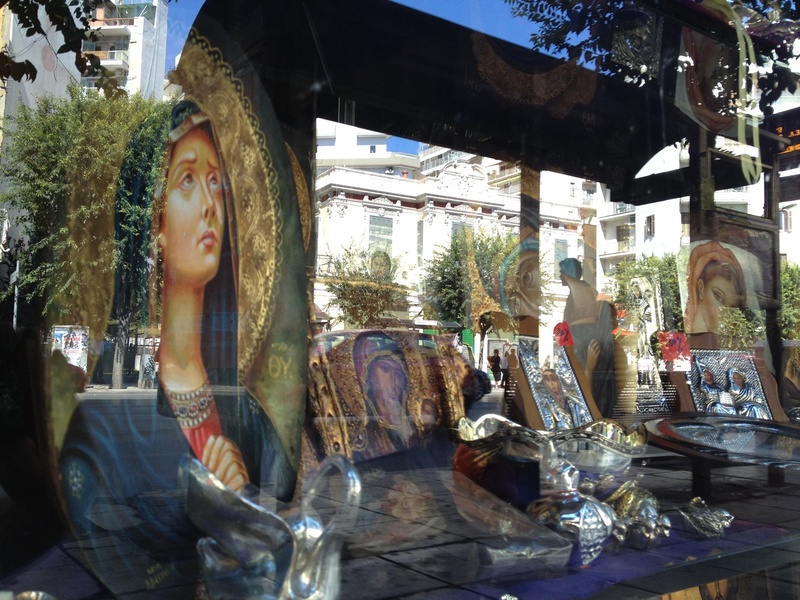 Despite the potential for chaos, I felt quite safe everywhere I went in Thessaloniki, even when I was out by myself. However, I didn’t get a chance to visit the oldest part of the city where it’s acropolis is located, so I can’t speak to the atmosphere of the whole place. But my hotel was allowing the police to use the facilities from time to time, and things felt stable enough to me. 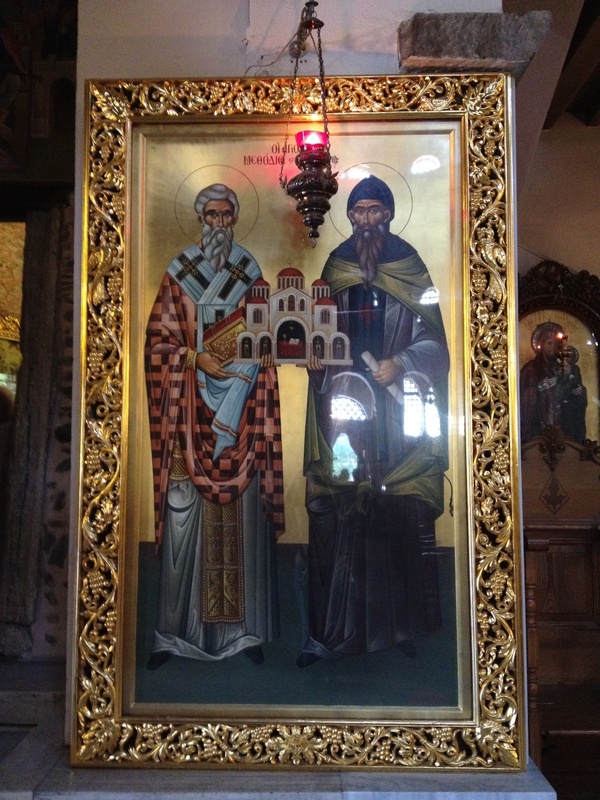 I love to see depictions of saints holding models of churches. This one appears to have a Byzantine cross plan. There was also some sort of transit strike on the morning I left. I had to take a cab to the airport instead of city bus, and my flight to Rome was delayed for an hour. After we finally landed in Rome, the folks at the airport forgot to deliver one buggy of luggage to the baggage claim. That delayed about 40 of the passengers, including myself, for about another hour. I helped get that sorted out by alerting the airport personnel to the problem. 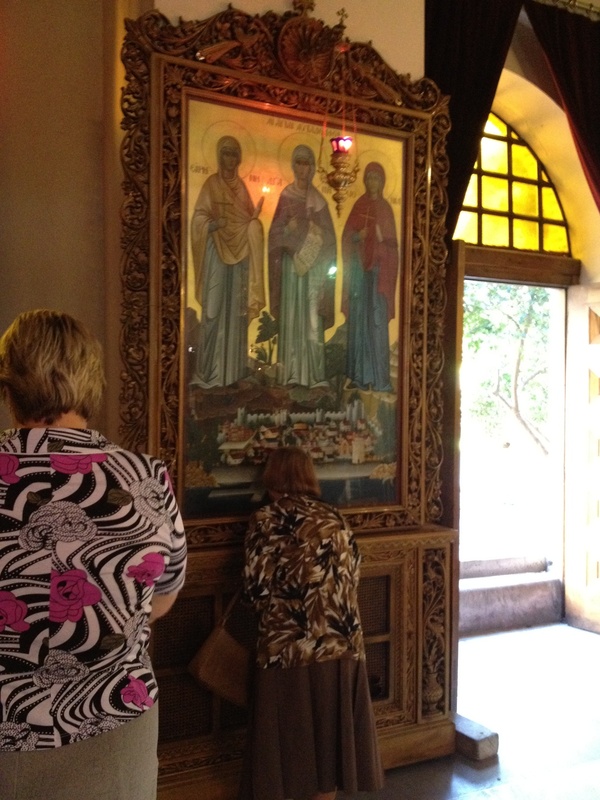 Each time they enter the church, they visit each important relic. And kiss each and every one! Overall, I was amazed at how orderly the others on the flight were in loading the plane and, later, waiting for luggage. Several of them even waited for my luggage–the very last of the set–to emerge before they set off for the city. They went out of their way to make sure I was okay! I lit a candle in honor of Dave’s dad. The flights themselves were great. I managed to get window seats on three of my four flights. As I write this, we’ve just flown over the Ligurian coast of Italy (where Dave and I spent a week this past summer). I must admit that the mountains that looked so scary from the passenger seat still look scary! We blew a tire when we accidentally went off-roading. On another note: it feels terrific to know the landmarks of Italy and of Rome well enough to get around without a map. Yesterday, when the busses of Rome were detoured around the city center, I was able to help many tourists find their way. I don’t even need a map for getting around Dublin, because I spent so much time apartment shopping on line before I arrived! I felt pretty good after an hour of transcribing. The veggies I had for lunch were wearing off. I’d polished off the goat cheese Dave left me in the fridge. Feeling wilted, I decided to treat myself to some veggie nut loaf at Mulligan’s Grocer, a restaurant I’ve mentioned before. Yum! This is one of Dave’s favorite meals in Dublin. It perked me right up! Returning home, I conquered the interview tape by 10:30 PM and found reason to celebrate when I got some good news from Google Alerts. 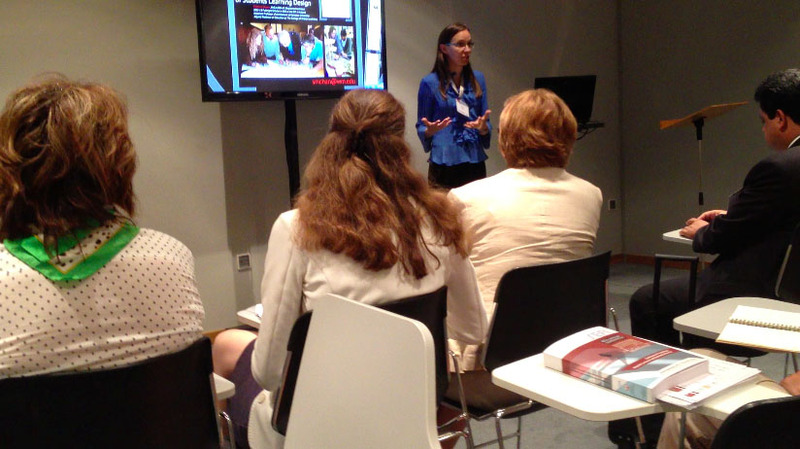 William and Mary just published a story about the class I taught this summer. Check it out! Fulbrighting is in full gear here! The weather is grand — chilly but sunny. And, surprisingly, it was a day without rain. That hardly ever happens. We usually get at least a few drops every day. As they say, “if you don’t like the weather, just wait five minutes” … it’s certain to change. They also say Ireland has four seasons in a day. Dave and I have definitely experienced that. I’ve learned never to leave the apartment without a small umbrella and a waterproof jacket of some sort. There’s little humidity in the air here in Dublin. Gavin joked yesterday that humidity tends to fluctuate between 0% and 100%. (Scientifically speaking it’s probably more like 30% and 100% since 0% would be unGodly dry, but the idea is right on. A hundred percent is, of course, when the air can no longer hold the water and it rains or snows.) I’ll include a few random photos of the Dublin sky, snapped as I walked to various buildings at DIT today (the buildings are spread out all over town). Among other activities today, I met with Gavin to discuss definitions of “design” and their relationship to epistemology (the way individual understand “knowledge” and what it means “to know”). Computer Science lecturer Damien Gordan walked past and joined the conversation (see photo). I’m looking forward to talking with him again soon. So energetic! 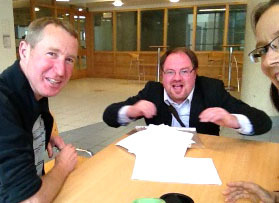 Chatting with Damian Gordon from Computer Science, who, like us, also does educational research. Everyone here is amazingly welcoming. Gavin’s office-mate, Kevin, gave me a his own personal HP printer (his wife has just purchased a new one). The librarian at Bolton Street, Brian Gillespie, checked me out a book using his library card, since mine’s in the works. The Head of Mechanical Engineering and Product Design asked me to submit a paper for his upcoming conference. I could go on… but there’s even more exciting news. In a few days, Gavin, the Dean of the College, and I will all fly to Thessaloniki, Greece for a conference sponsored by SEFI (the society of European engineering educators). Gavin will be presenting two papers and I will be presenting two as well. One of the papers we wrote together, so we’ve got a total of three presentations to deliver between the two of us. Strangely, all three of these presentations fall in the same time block. We’ll get to see exactly how many places we can each be at one time! When the conference ends, Gavin will zip back to Dublin mid-week to teach classes. I don’t have to be in a specific class next week, and my flight choices all required a lengthy stop-over. So… I took full advantage of the opportunity. I chose Rome as my through destination and I scheduled a stop over for three nights on the way back. I’ll return to Dublin in time to work Saturday and Sunday. I have a huge amount of homework to complete for the following week (the same week my Mom and her two neighbors are arriving for a visit). But I can’t fall behind in my work. Gavin and I must stay on our toes in order to complete our study in time for the January 7 journal deadline. Oh, yes, Sima phoned today to discuss lecturing schedules and research plans. She’s been following the blog and she called with a very excited tone. She’d not noticed the BYOF sandwich board right outside their building, and neither had the other lecturers. They learned about it from my blog and got a big laugh. I should have taken a photo in the window of that pub yesterday. The students were just back and they hadn’t packed lunches either. So, there were plenty of students in the pub, but few had BTOF (Brought Their Own Food). On a parting note, I also had to stop for some produce today and I leave you with the following delightful image+thought=idea. The veggie assortment pictured below was labelled as “soup mix.” How cool! 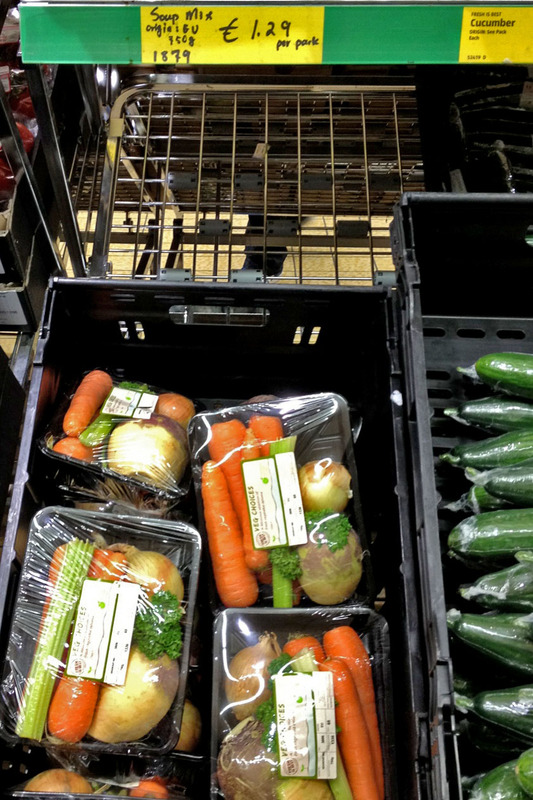 ‘Course I’m gonna steam my veggie assortment instead… and I think I’ll do that right now! Apologies for any typographical errors… but I need to go eat… and work on that SEFI presentation… YIKES! Soup Mix — Irish Style! 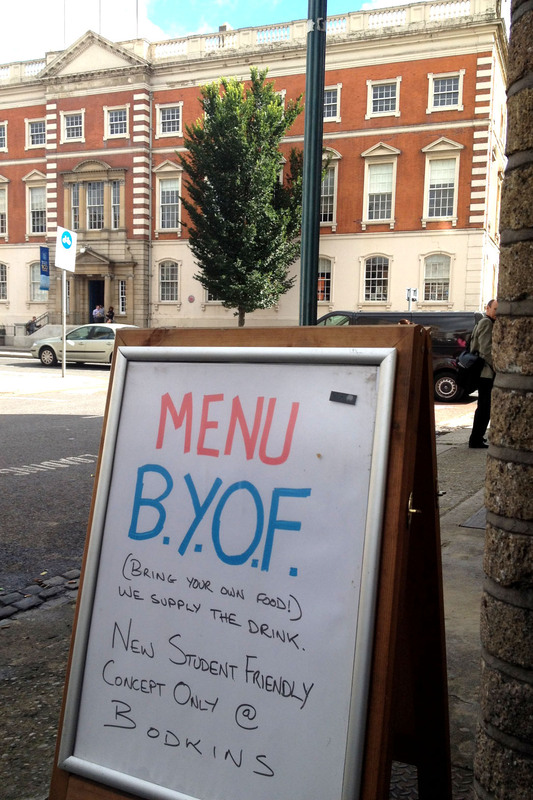 BYOF (Bring Your Own Food) — a novel concept! 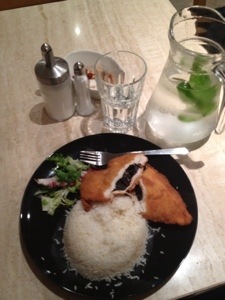 My Hungarian lunch — chicken stuffed with prunes. See how innovative they are!?!! I hadn’t packed a sandwich, so I’m down the street eating lunch at one of my old favs. Perhaps it’s me lacking innovation today (though my chicken stuffed with prunes was a bold new choice). Turns out my old fav is now owned by Hungarians… so there’s a much different menu but a lot of enthusiastic hospitality. Sima with work by fourth year Architectural Technology students. It was a fabulous first day of school! I’m off to yoga momentarily, but I thought I’d post some pics of my collaborators. 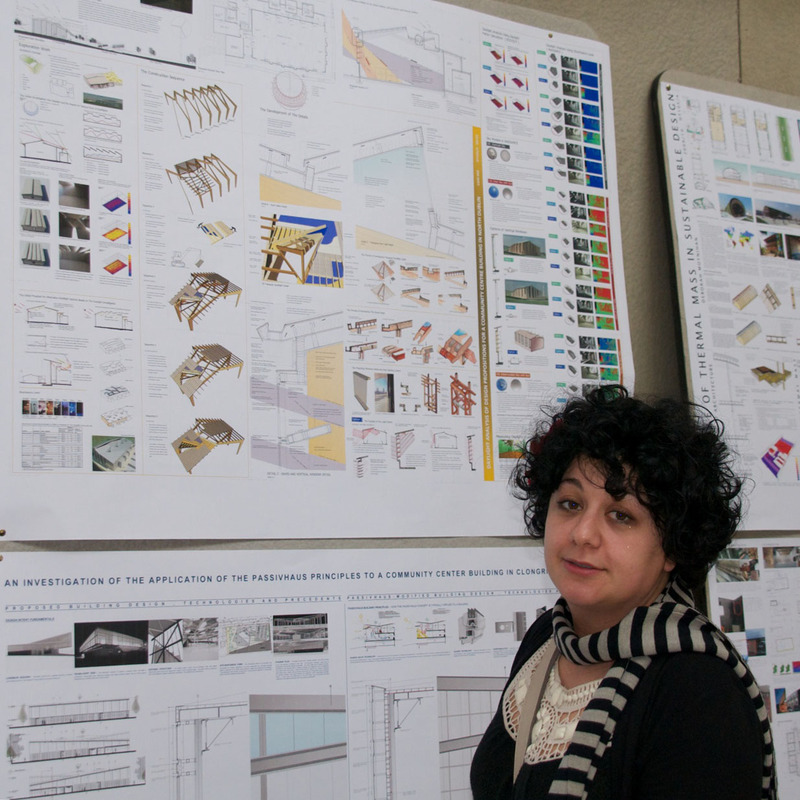 Meet architecture lecturer (i.e., professor) Sima Rouholamin and engineering lecturer Gavin Duffy. The photo of Sima is from the March 2011, when I visited her studio as a guest critic. 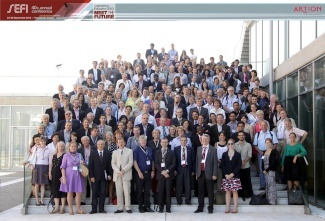 The photo of the students, Gavin and I was taken March 2012. The students had built robotic cars and were racing against each other at mid-terms during their spring semester. They were placing for seeds in the end-of-semester competition. I’ll get to watch the entire competition unfold this time around…. 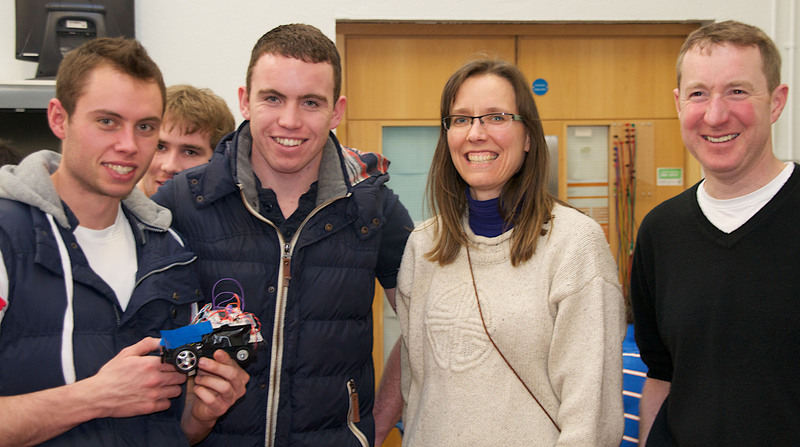 Electrical engineering students with Shannon and Gavin. Shopping for kitchen supplies on Henry Street. I had to ease myself back into reality a little today. Tomorrow will bring the first day of classes at Dublin Institute of Technology! I’ll be resuming work on my research project: meeting with my collaborators at DIT, settling into an office, and hopefully securing a library card and putting it to good use. I did some work today to gear up. Although I didn’t complete as much as I’d intended, I did get moving in the right direction. I also forced myself to start using the kitchen in my apartment… which means that I discovered all kinds of things I’ll need in order to accomplish any degree of cooking here. Up until now, Dave and I have been living like we’re on holiday (and eating out for every meal!?!!). We hadn’t really gotten to see tourist sights when we were here in March 2011 and March 2012 because I was busy laying groundwork for the upcoming project. We’ve tried to make up for that oversight by spending quality time together before our fall schedules consume us. 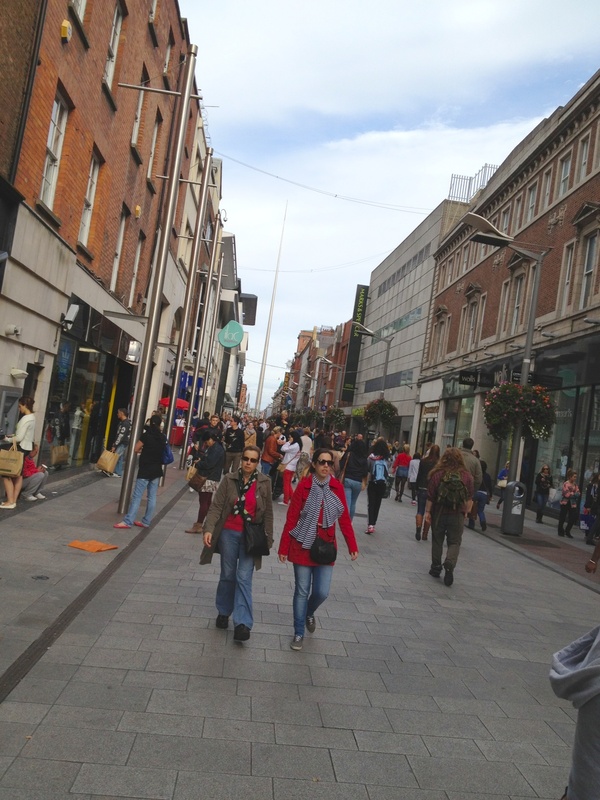 Dave and I throughly enjoyed exploring Dublin and “beyond the Pale” (the Pale being Dublin). I’ll soon post more about what we’ve seen. Over the past three weeks, Dave and I also put a lot of effort into creating our home away from home. Nevertheless, today’s foray into the kitchen revealed the need for yet another shopping trip. And fortunately, great shopping is just a few blocks away! 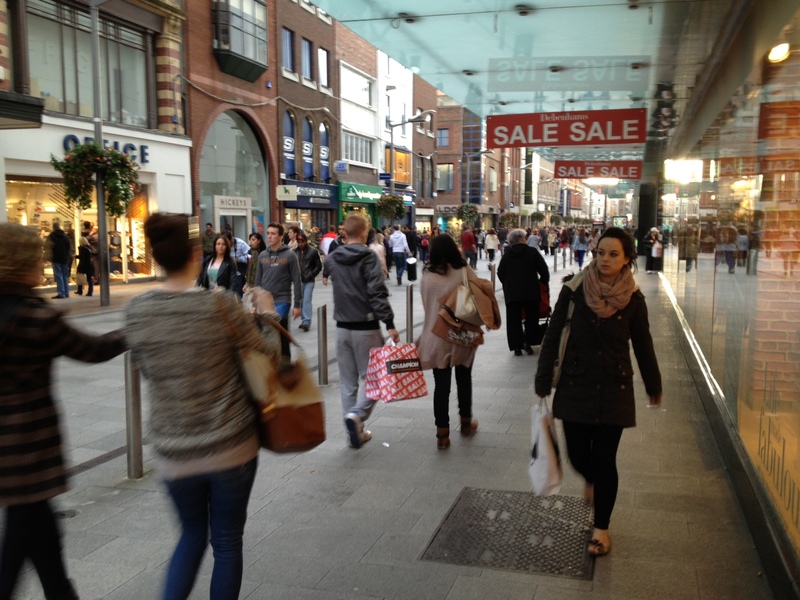 Throngs of people shopping on Henry Street today. I must note, though, that great restaurants (like Mulligan’s Grocer and Seven Social and Cinnamon Cafe) are just as close. Will power is going to be a critical aspect of eating at home. 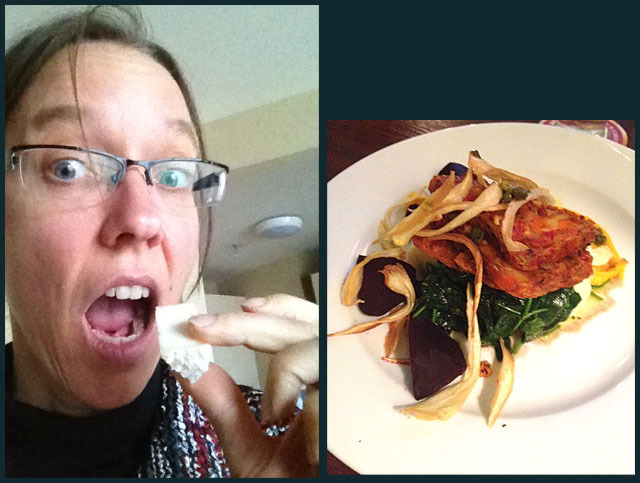 In any case, I was very hungry today since I also took my first yoga class in Dublin. I’d registered online last night with The Elbowroom (which is also just three blocks away) and ventured there for class this morning. After class, I wrapped up some final editing for a journal article that’s “in press” and I sent everything off to the editors. Then I headed out for kitchen supplies. In this blog, I’ve posted images I took after I was loaded down with purchases — which was exactly when it dawned on me that you’d probably never imagined shopping like this. Shopping here is so very different than shopping at home (with a car and with a sea of asphalt and plastic shopping bags). Here, I have to carry everything back to the apartment… on my own back. You’ll notice (in the top photo) that I’m covered with straps. They’re from the Envirosax bags I tote along with me everywhere I go. In Europe, you bring your own bags to the store with you. Many department stores here are happy to supply bags, but grocers and discounters (like IKEA and Argos) charge extra for bags. Moving on to evening hours: since I don’t have a TV (by choice) and (sadly) couldn’t watch Downtown Abbey, I opted for a play at the Dublin Fringe Festival. It was a superb two-woman play called “Payback!” at Bewley’s Cafe Theatre on Grafton Street. 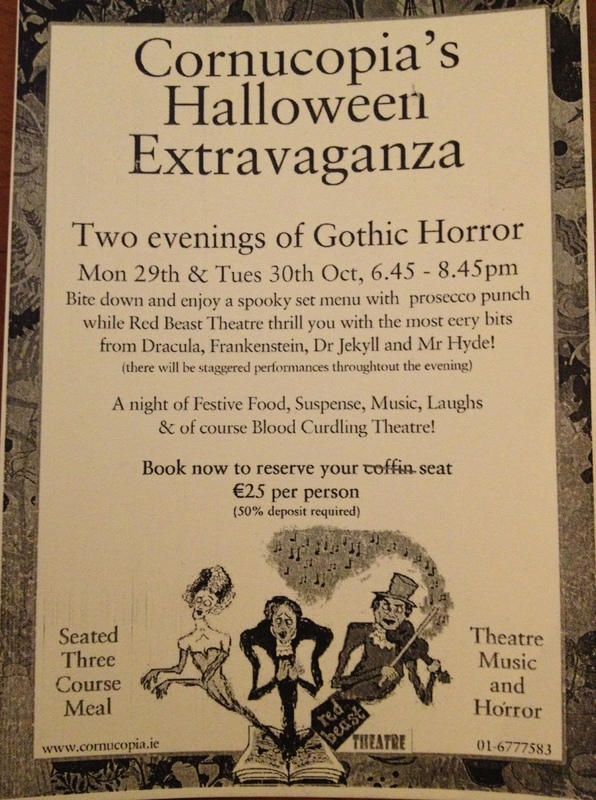 Tickets are just 10 Euro each — a real bargain! 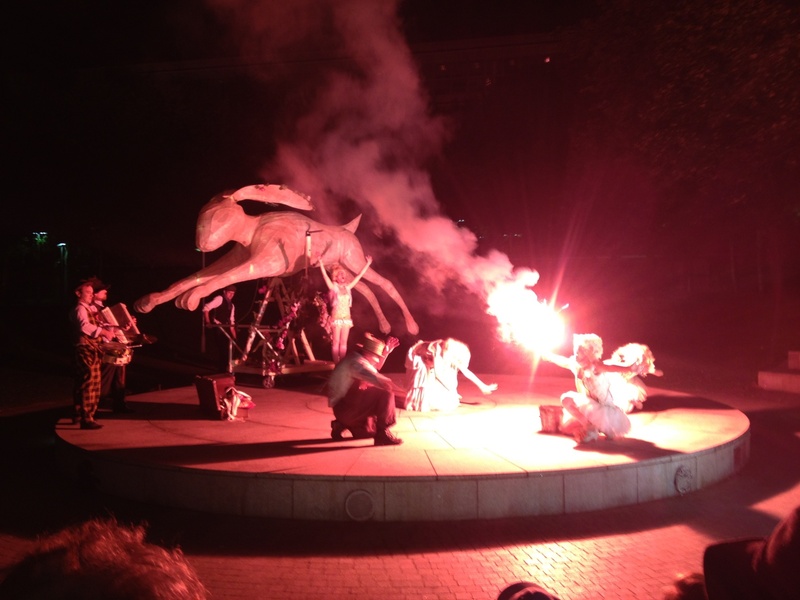 Play I saw with my sis at the Dublin Fringe Festival. It was a very high quality production, lots of fun, and absolutely free! I enjoyed it immensely even though I didn’t know most of the theatrical references (including A Midsummer Night’s Dream and Alice in Wonderland… I’m quite rusty with regard to both). Thanks to my sis for helping me realize that Dublin theater is phenomenal, not to be missed, and not all that intimidating. Now I’m gaining skill at selecting and booking tickets. I’ve already purchased a ticket for a play in the upcoming Dublin Theater Festival — which is completely different from the Fringe festival that is currently underway. 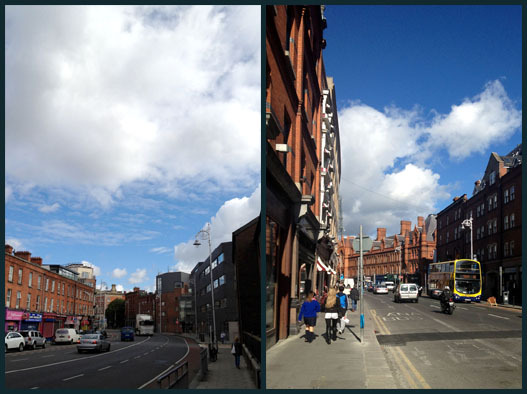 Dublin was awash in sunshine today! We awoke this morning for breakfast with two of our house guests–Amanda Bernhard and Jonathan Kennedy–who are in Galway for the year studying Irish. They have a very interesting blog going and they manage to post it in Irish and English. I invited them to stay an extra night after the Fulbright Orientation, so we could go to the Cobblestone Pub that’s just down the street. It’s known far and wide as the best place in Dublin to hear traditional music. Amanda and Jon each play instruments and they joined in with the other musicians playing at the pub last night. I’m hoping Dave will provide images of Amanda with her fiddle and Jon with his pipes, so I can post them for you. We are absolutely loving city life. Everything is right here… no need for a car day-to-day. Following breakfast (which included a tasty bowl of porridge with rhubarb at the Cinnamon Cafe), I visited a photo exhibit while Dave enjoyed the weekly outdoor market and the wine festival in Meeting House Square. 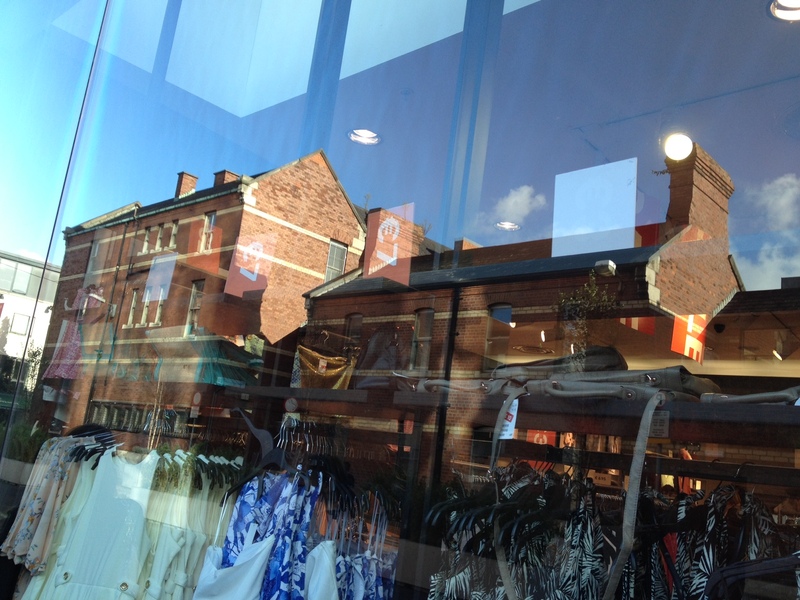 Then we both headed over to the Oxfam Home store (which sells used furniture) and the Dublin Food CoOp. Yelp has proven quite helpful in locating local favorites such as these, which came highly recommended by Peter and Mark at Kildare Street Hotel. As we ran our errands, we also stubbled across one beautiful place after another. 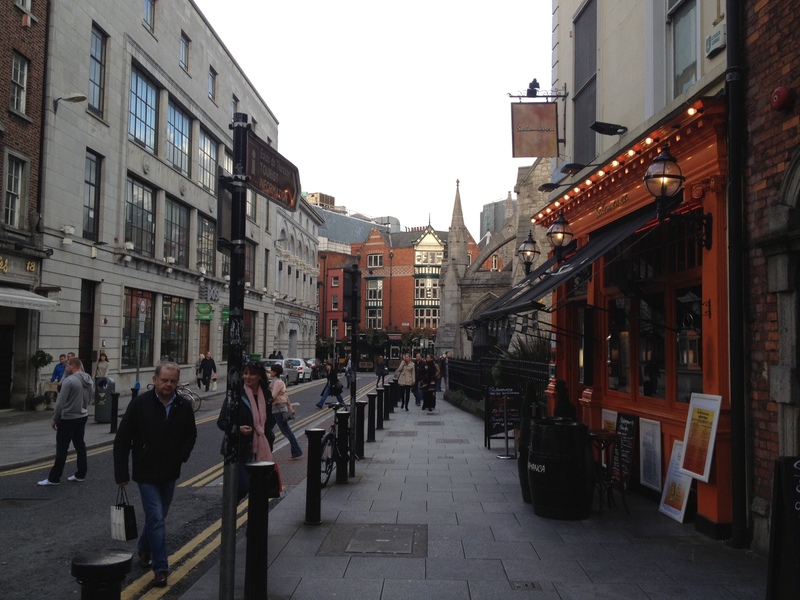 I’ve attached a snapshot of the park beside St. Patrick’s Cathedral that we strolled through. After a quick bowl of soup for lunch, I dashed off to see a play with my sister, Heather Massie, who is visiting for the Dublin Fringe Festival. 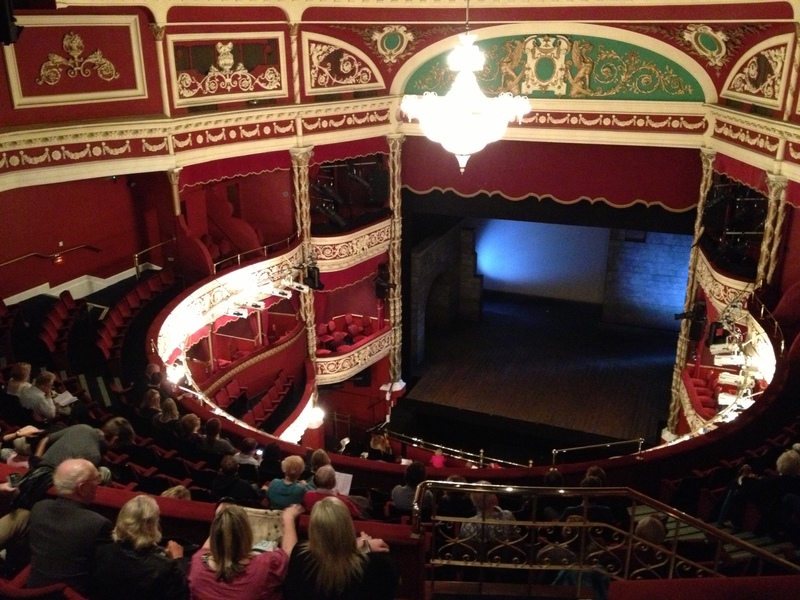 The play “Guerrilla Days in Ireland” was performed at the beautiful Olympia Theater. It was a nice complement to the play we’d each seen last week called “The Plough and the Stars.” Both relay twentieth century Irish history. Amazingly, Heather has seen ten shows in the week she’s been here–in addition to taking a bus trip to Kerry, meeting us in Galway and Connemara for three days, and coming along on one day of Fulbright orientation with me (to see the Hill of Tara and Trim Castle). Today she visited the Goal (former jail), art museum and its gardens, the Queen of Tarts…. In other words, it’s been quite a busy week. I’ve just reported about the tip of the iceberg! I’ll have to tell you about our other adventures in future days. I do enjoy the comments you post and emails you send….